• How are we scholarly in our art making and artistic in our scholarship? • How can we use critique to grow as artists and people? • How can we both reflect and affect our environment through art? AHA students learn by doing. Interdisciplinary projects structure the core of AHA’s educational philosophy, combining Arts, Humanities and Science curricula. Emphasizing collaborative work, student responsibility and critical thinking, these projects inspire high levels of achievement by linking student interest in the arts to all aspects of their education. Students emerge as seniors with a holistic understanding of their environment and the surrounding world. Critical thinking skills are vital to our students’ development as responsible citizens. AHA teaches a school-wide approach to critique, applying the Studio Habits of Mind throughout the curriculum. Through these consistent reflections, students become adept at analyzing an artistic or academic problem from multiple perspectives: experiential, literal, interpretive, thematic and evaluative. Mastering this skill of critical reflection, AHA students become life long learners and contributing community members. With just sixty students per grade, students quickly feel the benefits of a smaller school setting. Throughout their three years, AHA students study science, English, history, math and the arts within the learning community; they select world language and physical education courses from the many options from individual departments. 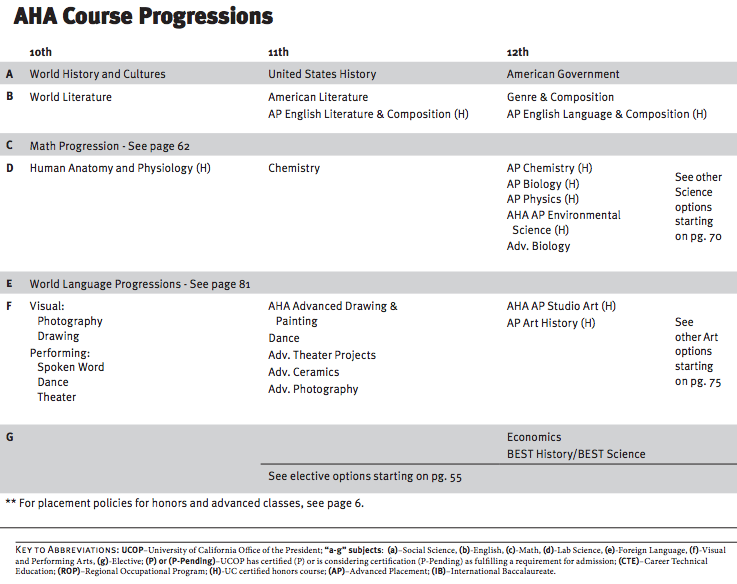 Advanced Placement (AP) and honors courses are available in the arts, English, science, math and world language. AHA courses meet the California Content Standards and most meet the UC/CSU entrance requirements; students graduate from AHA prepared for success in a college or university and continued pursuits in the arts.